72 • RV PRO • November 2018 rv-pro.com D E A L E R S S ome retailers struggle to connect with cus- tomers. However, that was far from the case with American Family RV in Chesapeake, Va., which opened for business in January 2012 and immediately started outgrowing the space. In fact, things got so crowded so quickly that owner Layne Rowland had to move his service depart- ment to a 5-acre property eight minutes away from the main dealership. He spent three years looking for a new, larger location in the Chesapeake area before giving up, he says. Instead, Rowland opened two new dealerships this year in cities hundreds of miles apart – Salem and Fredericksburg, Va. "That was one of my motivating factors that made me decide even more to go and open the Salem location," he says. "I could not find the property to grow, so it made me consider looking in different markets." There is no magic formula behind the dealership's rapid growth, says Rowland, who attributes the success to hard work, seizing opportunities and a strong focus on customer service. New Year, New Stores American Family RV opened its location in Salem on Jan. 1 of this year at the site of a former Dodge dealership and cel- ebrated its grand opening April 1. "The facility is beautiful. The technicians' garage is superior to anything that I have in any of the other locations," he says. 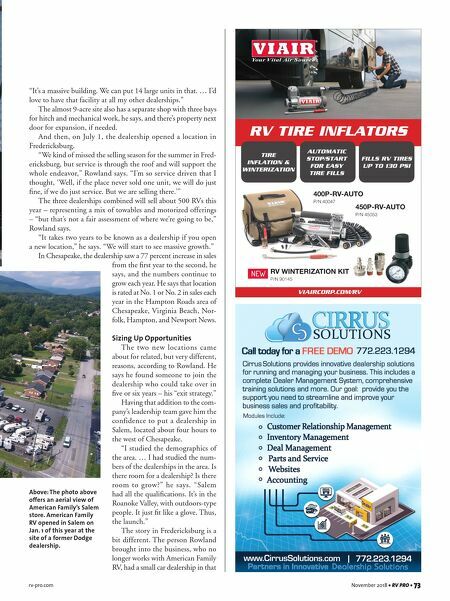 In six years, American Family RV has grown to three locations in Virginia, with customer service and family at its core. By Craig Young American Dream Owners Carol and Layne Rowland review the inventory on the sales lot of American Family RV's Salem, Va., location.